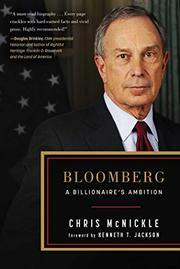 A biography of three-term New York mayor Michael Bloomberg (b. 1942). There was a time, early on in Bloomberg’s bid for the mayoralty of New York, that someone leaked a gag gift given to him by his staff, a 30-page compendium of foulmouthed, cynical sayings—“politically incorrect does not begin to describe them,” writes McNickle, a former executive in global investment firms and treasurer of the American Historical Association. Consternation ensued, as political opponents lodged charges of racism, sexism, and classism in a race that got ever more heated—and, as the author writes, ever costlier, with Bloomberg, a media and real estate billionaire, spending $74 million to his Democratic opponent’s $16.6 million. The big-ticket aspect of the narrative is a constant, for Bloomberg had endless resources and was committed to converting the city from “an unintended monument to time-gone-by into a place where the future could happen.” In the course of that transformation, McNickle writes, large portions of the city became unaffordable, “one of the root causes of the long-standing homeless crisis.” The author credits Bloomberg for some innovations in government operations but, in some of the sharpest critiques of the book, also notes that the current mayor, Bill de Blasio inherited a fantastic mess in terms of public housing and anti-poverty programs. Bloomberg also was slow to support the living wage, saying, “the last time we really had a big managed economy was the USSR and that didn’t work out so well.” Unafraid to use numbers or evoke fiscal policy, McNickle covers a lot of ground capably, arguing that Bloomberg’s preference was always for market solutions to social problems, placing him as an economic and social centrist in a time of increasingly fringe-driven politics. A sturdy biography; though not uncritical, probably best suited to those inclined to be well-disposed toward Bloomberg and his years in office.